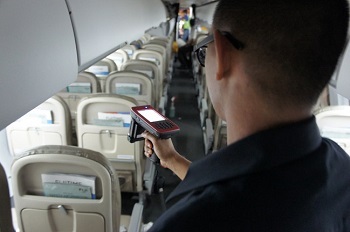 Fiji Airways is implementing Radio Frequency IDentification (RFID) to improve in-cabin inspections for emergency equipment onboard the aircraft such as life vests, life rafts, oxygen bottles, fire extinguishers, extension seat belts, earmuffs, flashlights, survival kits, and oxygen generators across the A330, B737, ATR, and Twin Otter fleet. Fiji has completed the large installation of over 4,000 ultrahigh-frequency RFID tags throughout its entire fleet of 15 aircraft. EAM RFID Solutions, a division of EAM Worldwide, based in Dubai, is handling the installation with Fiji Airways. Fiji Airways has been using the EAM Worldwide life vests for over 10 years. EAM Worldwide is one of the first to implement RFID tags, leading the market with implementing the technology into the vests since 2009. Looking to further implement the RFID program, Fiji Airways and EAM RFID Solutions intentions are to deploy a wider Cyber Physical System (CPS) by tagging other items such as seat covers and other critical items inside the aircraft and seeking to advance RFID with more opportunities with system integration.